This Adjustable Height Bathtub Grab Bar Safety Rail by Drive Medical was designed to fit just about any style of bathtub. The attractive white powder coated steel frame is durable and aesthetically pleasing. The grip bar height adjusts from 14" to 17" allows you to find the perfect height for your needs. The width adjusts from 3"-7". The angle of the grab bar is parallel to the shower wall. The adjustable width clamp attaches by turning the locking mechanism which tightens the rubber pads on all bath tub contact points. The rubber pads prevents scratching of the tubs surface and ensure a secure fit. 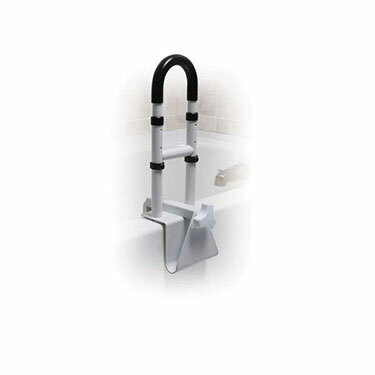 The Bathtub Grab Bar Safety Rail is easy to install without needing tools. Weight Capacity of 300 lbs. Please note this safety rail is not for use on fiberglass tubs. No assembly, easy to install, strong good product.